Tuesday, UTT’s President John Guandolo was in Redmond, Oregon speaking to the Deschutes County Republicans. 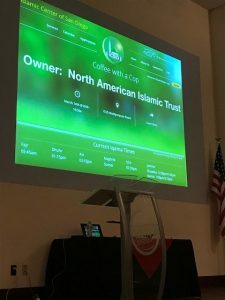 Hamas doing business as the Council on American Islamic Relations (CAIR) along with the Deschutes County Democrats tried to shut the event down. They failed. The event was a great success. The truth was spoken and the audience was given evidence revealing CAIR is Hamas. Wednesday, John Guandolo spoke at a luncheon hosted by the U.S. Naval Academy Alumni Association (USNAAA) of San Diego and was joined by the other members of the UTT team. In the days leading up to the event, Hamas/CAIR’s national office and its San Diego office tried to shut the event down. Hamas/CAIR went so far as to directly contact the President of the U.S. Naval Academy’s Alumni Association, Board Members, General Counsel and others to shut the program down. 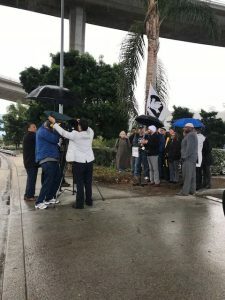 Hamas/CAIR’s chief propagandist Ibrahim “Dougie” Hooper even organized a “protest” at the venue which was attended by a few Hamas operatives and their useful idiot friends in the community – about a dozen total. In their report of the event, the ignorant and unprofessional Fox 5 News Channel in San Diego called Hamas/CAIR a “muslim civil rights organization.” ABC News 10 was no better, and essentially read the notes provided to them by Hamas/CAIR about the event. 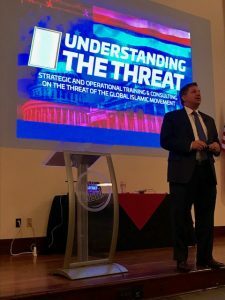 But the event happened, and the large crowd of active duty and retired Navy and Marine Corps officers got an unvarnished dose of reality about the threat from the Muslim Brotherhood’s Islamic Movement. Evidence from the largest terrorism financing trial ever successfully prosecuted in American history [US v Holy Land Foundation for Relief and Development, Northern District of Texas (Dallas) 2008] was presented which reveals CAIR was created by the U.S. Muslim Brotherhood’s Palestine Committee, which is Hamas. Another defeat for Hamas/CAIR at the hands of UTT. The Hamas leader of the CAIR office in San Diego, Hanif Mohebi, actually tried to get into the event. Mohebi was informed he was not welcome. However, other Hamas supporters were inside the event. One was retired U.S. Navy Chief Hospital Corpsman Yusuf Miller, who is a sharia adherent muslim. Miller openly supported Hamas/CAIR outside the venue, and then defened Hamas/CAIR inside the event by trying to claim there was “no evidence” CAIR is linked to Hamas. Some in the audience actually laughed when Miller said this because evidence had already been presented. 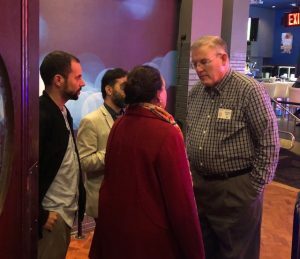 Imam Taha Hassane of the Islamic Center of San Diego was present inside the venue and also made a scene claiming the information was putting his mosque in a bad light. The facts reveal the Islamic Center of San Diego is a Muslim Brotherhood/Hamas mosque – it is owned by the North American Islamic Trust (NAIT). Two of the 9/11 hijackers were given support by the Islamic Center of San Diego and its members. Hassane ended up screaming and was escorted out of the room in disgrace. In the end, the UTT team was told by many in the audience, including senior retired military officers, they were not aware of the information and want to ensure more leaders in the military and community get the information because – they believe – it is vital to the security of the communities in and around San Diego. For those keeping score at home…. Furthermore, given that there are currently one-thousand U.S. military installations strewn across 138 countries, (many of which are Islamic), and bearing in mind that pedophilia according to sharia-adherent Muslims is an inalienable right as opposed to the grotesque dehumanization of helpless children which according to Article-7 of the U,N. International Criminal Court’s* “Rome Statute” is a crime against humanity, one cannot help but wonder whether or not (particularly) the senior military retirees present at the U.S. Naval Academy Alumni Associates luncheon in San Diego, who professed to be previously unaware of UTT’s contextual revelations, were also oblivious to the existential war** the country is in, or for example to the despicable outrage which follows. I.e., a relatively recent news report has revealed that rank-and-file U.S. Marines and/or American soldiers in Afghanistan (to where 6000 additional U.S. combatants are imminently scheduled to deploy, and thus put their lives on the line on behalf of the American people) have been excoriated, threatened with punishment under the Military Code of Justice and officially ordered by non-coms (presumably at the direction of commissioned officers) to discontinue their manly & admirable interventions on behalf of helpless little Afghani children which are intended to stop and/or prevent acts of unspeakable pedophilia perversion. And since the origin of said misprision-of-treason had to have been fashioned either in Congress or at the Pentagon from where suicidal rules of engagement created by erstwhile misfits were also blithely imposed on our heroes, the issue of political correctness stemming from abject widespread denials that 9/11 was a declaration of war**, should be explored by competent authority and severely punished under the U.S. Code or by a military court martial whose members are cognizant of the fact that the country’s continued existence is at stake. *The United States is no longer adherent to the Rome Statutes by virtue of having withdrawn its earlier acquiescence (probably at the behest of the OIC (an organization of 57 Islamic countries which constitutes the largest United Nations voting bloc on the planet). **Anyone wishing to acquaint themselves with their inevitable destiny at the hands of sharia-adherent killers, unless the frauds and sleepwalkers currently attempting to destroy the country are stopped, may do so by requesting (for a nominal handling & postage fee) an Arabic-to-English verbatim translation of Islam’s declaration of war on the United States, which was seized by Special Agents of the FBI from a subterranean basement in Annandale, Virginia in compliance with a federal search warrant, in 2004, may simply contact http://www.securefreedom.org and request: GOVERNMENT EXHIBIT 003-0085 3:04-CR-240-G U.S. v. HLF, et al. Hamas supporters inside the event….that is an unnerving thought and situation but I guess is now routine. Of course, they are directed to disrupt an event that informs the attendees about the doctrine that exposes Hamas. More frightening is the information that was never before presented to these community leaders and military once it was suppressed by request from a Muslim organization that worked as advisors on the war on terror after 9/11, that had been identified by the 9/11 Commission. My state could use this information as I witness major changes and see the influence upon my city.